With desperate automakers asking Congress for $34 billion, Barack Obama unveiling key Cabinet members, and the U.S. scrambling to ease tensions between India and Pakistan, the three top storylines in the news intertwined last week. Fears of a deeper recession, job losses and the Detroit-bailout drama made themes about the economy the biggest story the first week of December. As Obama unveiled his national security team, coverage of the incoming administration was the No. 2 storyline from Dec. 1-7. The challenges that team will face were highlighted by the other major story last week, the fallout from the Mumbai massacre that inflamed international tensions and resurrected terrorism fears. Together, the three storylines accounted for more than two-thirds of the coverage in the weekly News Coverage Index of the Pew Research Center’s Project for Excellence in Journalism. They also reinforced a message growing ever more prominent in the post-election media narrative — that Obama will take office facing the most daunting set of crises since Franklin Delano Roosevelt in 1933. Indeed, one idea that surfaced in the week’s coverage, articulated bluntly by Rep. Barney Frank, was that Obama needed to, in effect if not officially, grab the reigns of power before his inauguration. As more grim signs of a financial meltdown emerged, the troubled economy was easily the top story the week of Dec. 1-7. 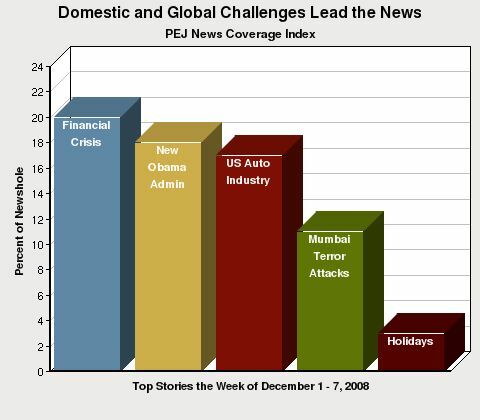 In its various facets, the economy filled about 40% of the newshole, a high level of coverage for that topic. The largest component was the financial crisis itself, which accounted for 20% of the newshole. That was followed closely by the troubled US auto industry, at 17%. To a lesser extent, the economic news also included mixed reports about holiday shopping — most notably Black Friday and Cyber Monday — and the only truly cheerful tidings for consumers, plunging prices at the gas pump. When it came to the financial meltdown, concerns about jobs and recession-related fears were the top themes last week. Even pessimists seemed surprised by the news that the economy shed about a half million jobs in November, the biggest single monthly decline in 34 years. But it’s less likely that many were stunned by the report that the U.S. has been in a recession for almost a full year. In fact, one newsworthy Black Friday event was a grim tragedy involving a Long Island Wal-Mart worker who was trampled to death by stampeding shoppers. “They’re savages,” one stunned eyewitness told a local TV outlet. Coverage of the incoming Obama administration filled 18% of the newshole from Dec. 1-7, about half as much as the economy. That biggest component of that story, more than half, was largely about a series of high-profile appointments; former Obama presidential rival Bill Richardson was named Commerce Secretary. But the big news was made on Dec. 1 when Obama rolled out a national security team headlined by holdover Defense Secretary Robert Gates and his former bitter rival for the nomination, Secretary of State-designate Hillary Clinton. Much of the coverage of Obama’s selections, generously leaked in advance, seemed to focus more on what they said about his temperament and style of governance than the potential policy implications. And in that context, the idea of the incoming president relying on a “team of rivals” emerged as a major theme. On Dec. 7, the president-elect appeared on “Meet the Press” where moderator Tom Brokaw opened the show with a stark question that captured and condensed much of last week’s media message. “Sixty-seven years ago this day, one of your predecessors, Franklin Roosevelt, faced Pearl Harbor,” Brokaw said. “What are the differences between his challenges and the ones that you face? The aftermath of the Mumbai terror attacks, which left more than 160 dead, only added to the sense of challenge facing Obama. In all, the story accounted for another 11% of the week’s newshole. Some of that coverage focused on immediate efforts by U.S. officials to keep the attack from escalating into open conflict between two nuclear-armed powers, India and Pakistan. But other aspects focused on the longer-term implications for U.S. policymakers and national security. On NBC’s Dec. 1 newscast, correspondent Andrea Mitchell said the attacks “set off shockwaves from Washington to Chicago” and could significantly hamper U.S. efforts in Afghanistan if Pakistan redeploys its troops from that border to its boundary with India. Under the headline “Mumbai attacks refocus U.S. cities,” the Dec. 5 edition of USA Today connected events in India directly with the homeland. “The deadly terrorist attacks in Mumbai are prompting new efforts to bolster security in the U.S. by law enforcement officials who fear the assault on India’s financial capital represents an unforeseen model for future attacks on U.S. soil,” the story stated. The week’s top headline makers tilted heavily toward politics and policy, with one notorious exception. The No. 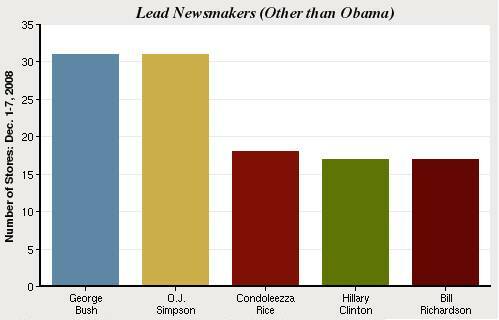 2 newsmaker (behind Obama, who was a lead newsmaker in 6% of the week’s stories) was O.J. Simpson (at 2%), who did not fare as well in his second go-round as criminal defendant as in his first. The former football star was sentenced last week to at least nine and up to 33 years in prison for his role in a bizarre attempt, complete with weapons, to take/reclaim some memorabilia in a Las Vegas hotel room. Tied with Simpson was a man whose remaining days in office have largely been eclipsed by attention to his successor. Last week, George Bush was also a lead newsmaker in 2% of the stories, thanks to an interview with ABC’s Charlie Gibson in which Bush acknowledged he was not prepared for war when he took office. The next biggest newsmaker, at 1%, was outgoing Secretary of State Condoleezza Rice, who spent some of the week trying to tamp down tensions between India and Pakistan in the wake of the Mumbai attacks. The next two major newsmakers included Rice’s just announced successor, Hillary Clinton, as well as incoming Commerce Secretary Bill Richardson (both at 1%). Beyond the five biggest stories of the week, which again all related to the troubled economy, the Obama transition, or the Mumbai attack, there was little room left for other events to garner much attention. The No. 6 story, at 3% of the overall newshole, was the Simpson case, an event that included an emotional plea (“I did not know that I was doing anything illegal”) from the defendant before he was sentenced. Next, at No. 7, (also 3%) were congressional election results, with the focus on Republican Sen. Saxby Chambliss’s decisive run-off victory in Georgia. The eighth-biggest story, at 2%, was related to Bush’s final days in office, and was driven by his ABC interview. The next biggest story, at 1%, was the political unrest in Thailand that included protestors occupying airports and led to the ouster of the sitting government. And those looking for a respite from the frightening headlines were not likely to be reassured by the No. 10 story last week — domestic terrorism, at 1%. Major news on that front last week came from a report commissioned by Congress warning of the growing possibility of a biological or nuclear terror attack on U.S. soil in the next five years. Just one more thing for incoming President Obama to think about.